O'baby! What it do fam, we heard ya out in TX grinding hard. How ya living big dawg? Living great. Staying focused you know? Loving the way things are going right now. Jay keep me buzzing and my brother keep me busy. Awready! Give us a lil background on O'Baby & how ya got ya start? Oh well I started rapping like REALLY RAPPING in like 03 wit a group but before that it was just dominating cyphers doing what a fly guy does, but I been critiquing my craft you know? My brother always tells me practice doesn't make perfect, perfect practice makes perfect so I'm constantly working on songs. To me it's nothing to freestyle and battle rap but what I try to do is put that energy in songs and creating songs people can dance to and enjoy. But I would say I really hit the scene in like '05. Since then I been full throttle, had a few set backs but every since I got with hustle fam youngin been doing his thang. Now the only way to go is up. Hustle hard. 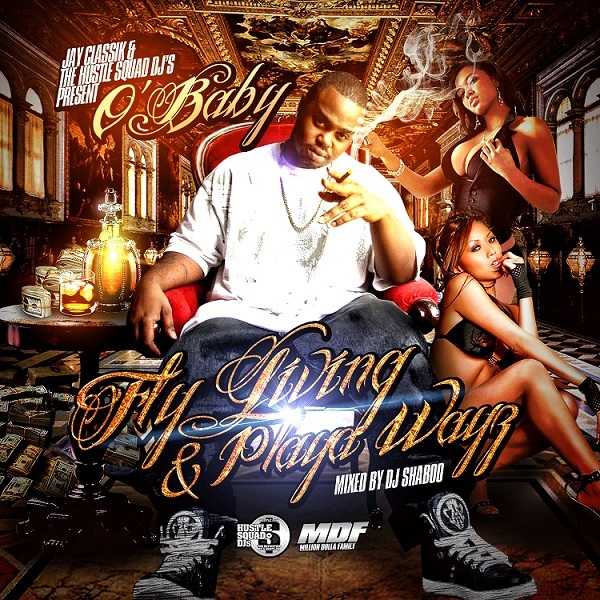 Fly Living & Playa Wayz is the mixtape & mixtape series you pumping right now, tell us a lil about that? Well I feel like I wanted to stand out from the norm and in Texas that means a style that everyone is using. I keep the substance tho and it was Jay who originally came up with the name. He was listening to the music and came back with the name. I was digging it and we ran a marathon with it. How did you hook up with DJ Shaboo out in Boston? Thru Classik, bro has really been like a mentor to me since the first day we linked up. He linked me in with Shaboo and we got on our pinky and the brain hustle. Taking over the world one mixtape at a time. Shout out to big bros Jay Classik and DJ Shaboo. You got the new single "Go 2 Wurk" jumping off, how did you come up with the song & what's the meaning behind it? Not to sound throwed off but when I'm composing, the beat really tells it all. I needed more club songs and I got sent the beat and it just came. The meaning?? Lol lets just say its explicit but to radio? It's a dance song made for the clubs, the next single we have coming is called "3000 1's" so be on the look out for that. Fly Guyz is the movement we see you building.....how would you define & what goes into being a Fly Guy? I work with two others when it comes to business. Jay Classik & my older brother Ace. Ace is one of the poster boys for what a Fly Guy is. Always on point. Hustle with a purpose. Staying sucka free. But to summarize it, it's a state of mind. Most of the Fly Guyz been that way, way before fly guyz was even thought of. I just simply put a name and some laws to it. Basically setting it in stone. The "fly" n the name stands for something but that's another conversation. So what else can we expect from O'baby & the whole Fly Guy Movement coming up? Fly living & Playa Wayz II dropping in a few. New single "3000 1's" and the remix to "Go 2 Wurk" something special in the making. Shows and hopefully a tour! There are no limitations. Where-ever this road takes me. I just going to work hard, stay in the studio, do shows, more mixtapes, more supporters and fans and deals..... And then work even harder. It's just a fly living and playa wayz thang. Ain't nothing to it.